o Tighten the cap until it clicks one time, otherwise the " "light will illuminate. 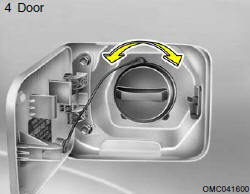 o If you open the fuel filler cap during high ambient temperatures, a slight "pressure sound" may be heard. This is normal and not a cause for concern. Whenever you open the fuel filler cap, turn it slowly. - Read and follow all warnings posted at the gas station facility. - Before refueling, note the location of the Emergency Gasoline Shut- Off, if available, at the gas station facility. 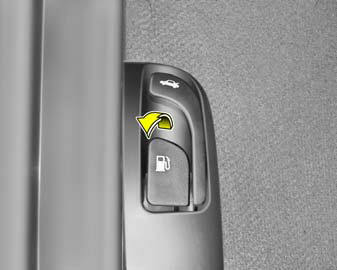 - Before touching the fuel nozzle or fuel filler cap, you should eliminate potentially dangerous static electricity discharge by touching another metal part of the front of the vehicle, a safe distance away from the fuel filler neck, nozzle, or other gas source. - Do not get back into a vehicle once you have begun refueling. Do not touch, rub or slide against any item or fabric (polyester, satin, nylon, etc.) capable of producing static electricity. Static electricity discharge can ignite fuel vapors resulting in explosion. 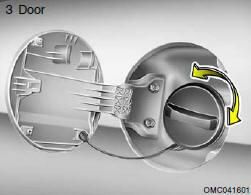 If you must re-enter the vehicle, you should once again eliminate potentially dangerous static electricity discharge by touching a metal part of the vehicle, away from the fuel filler neck, nozzle or other gasoline source. - When using a portable fuel container be sure to place the container on the ground prior to refueling. Static electricity discharge from the container can ignite fuel vapors causing a fire. Once refueling has begun, contact with the vehicle should be maintained until the filling is complete. Use only portable fuel containers designed to carry and store gasoline. - Do not use cellular phones around a gas station or while refueling any vehicle. Electric current and/or electronic interference from cellular phones can potentially ignite fuel vapors causing a fire. If you must use your cellular phone use it in a place away from the gas station. - When refueling always shut the engine off. Sparks produced by electrical components related to the engine can ignite fuel vapors causing a fire. Always insure that the engine is OFF before and during refueling. Once refueling is complete, check to make sure the fuel filler cap and door are securely closed, before starting the engine. - Do not light any fire around a gas station. DO NOT use matches or a lighter and DO NOT SMOKE or leave a lit cigarette in your vehicle while at a gas station especially during refueling. Automotive fuel is highly flammable and can, when ignited, result in explosion by flames. - If a fire breaks out during refueling, leave the vicinity of the vehicle, and immediately contact the manager of the gas station or contact the police and local fire department. Follow any safety instructions they provide.